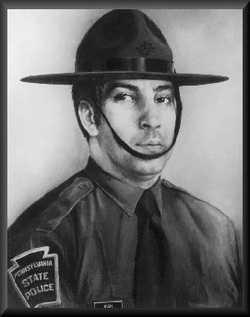 The Camp Cadet program was formed in 1970 by Trooper Albert R. Vish (shown at left), now retired, of the Pennsylvania State Police. Through his untiring efforts, this program became a reality. Trooper Vish along with John Prandy (Deceased), and Robert Price (P.S.P. retired) were instru-mental in establishing the first Camp Cadet in Butler County. For 42 years, his idea has provided the inspiration for the establishment of other Camp Cadet Programs across Pennsylvania. The program was originally called the "Pennsylvania State Police Camp Cadet" and funding was provided by the community to the Pennsylvania State Police. Since 1970, Camp Cadet programs have been established in approximately 30 other counties in Pennsylvania.